When Majora Carter got the call telling her she'd received the prestigious 2005 MacArthur Foundation Prize, she couldn't believe it--literally. "I thought I recognized the phone number as a friend of mine," she says, laughing, "so I gave him some attitude." Carter's attitude, however, is exactly what earned her the so-called "genius grant" in the first place. 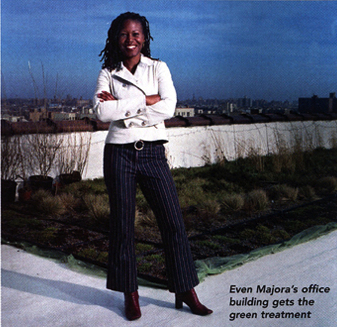 Relentlessly committed to initiating to environmental improvements in her native South Bronx, Carter has been slowly realizing her vision to "green the ghetto," an endeavor she hopes will one day transform her smokestack surroundings into an Emerald City of parks. The 38-year-old's path to activism was a rocky one. In the '70s, Carter watched her tight-knit urban neighborhood deteriorate into a smoldering wasteland. "The whole block smelled like burning," she recalls. Industrial plants moved in, people moved out, and when she graduated from high school, Carter jumped at the chance to jet. After studying film at Wesleyan, however, she moved back home in the late '90s and soon heard about the city's proposal to build a major waste-transfer station in the South Bronx, an area already handling 40 percent of NYC's trash. It was then that she and her friends decided enough was enough, so they fought the plan—and won. "Suddenly, it was attitude city," she says of her political emergence. "No one ever asked residents what they didn't want, but no one asked them what they did want, either." To address these issues, Carter founded Sustainable South Bronx in 2001. Through this community organization, she has planned a "greenway" where residents can work out and helped to open the neighborhood's first waterfront park in 60 years—a project that began after her dog, Xena, led her to the hidden Bronx shoreline through an illegal junkyard. Giving pointers for young activists, Carter advises, "Use the energy that you have, and recognize that you get a lot of crap for being younger. No matter how small you are, you have to act like you're enormous."